Genoa, named and established by the Mormons in 1857 has a rich heritage of history beginning long before that time. The Skidi Pawnee have lived in this area since the 1600s with ancestors dating back to the 1300s. Ruts of the Mormon Trail are still visible south of Genoa revealing the arduous 1,000 mile trek the persecuted Saints followed to reach their haven at Salt Lake City. In 1857, coexisting with the Pawnees, Mormon pioneers established Genoa as one of the settlements along the trail. It served as a way-station for the Brigham Young Express & Carrying Company, which had the government mail contract to Salt Lake City, and as a supply stop for thousands of Saints that traveled across the plains. 110 families of Mormons left St. Louis under the leadership of Henry Hudson to Florence and then overland to set up a colony near the junction of the Beaver and Loup Rivers. They began to fence the land and plant crops, built a "steam-powered mill, then log, frame, and sod structures were erected to home the settlers and their livestock. After just two years in the fall of 1859, the Mormon Colony was forced to abandon Genoa when the settlement became part of the newly created Pawnee Indian Reservation. The Pawnee Indian Agency moved into the vacated Mormon buildings and proceeded to build a large, brick schoolhouse. Genoa served as the Pawnee Indian Agency until 1876, when the Pawnee were removed to the Indian Territory and the reservation lands offered for public sale. An Indian industrial school was opened utilizing the "big brick building" in 1884. 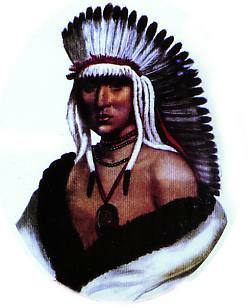 The students that came from ten states and over 20 tribes had to be at least one-fourth Indian. In time the school grew from the original 74 students to an enrollment of 599, and encompassed over 30 buildings on 640 acres. In addition to schooling, students learned a trade by working in the carpentry shop, harness shop, tailor shop, school, hospital, bakery, laundry, dairy barn, cheese factory, blacksmith shop, horse or cattle barns, farm, or gardens. Before it closed in 1934, it was said to be one of the largest, most successful, and longest-lived of the federal Indian schools. In 1951 most of the buildings were auctioned off. The shop building, now on the National Register of Historic Places, was restored in 1981 as a visitors center. The Pawnee Indian heritage is preserved at the Allen Atkins Collection in Genoa, and there are numerous archeological sites in the area. Since the 1900s Genoa has maintained a fairly even population, between 1,100 and 1,200 people. Primarily a rural community, there are 52 businesses, a K-12 school with over 350 students, and four churches: Catholic, Congregational, Lutheran, and Methodist. Genoa has become a center for retirees with a senior center, senior bowling day, the Golden Age Band, meals-on-wheels, two nursing homes, a retirement housing unit, plus a 60-bed facility added to the hospital. The town also has a youth center and offers many recreational activities; swimming, tennis, baseball, softball, roller skating, and bowling. Pawnee Days, the third weekend in July, features a demolition derby, livestock show, barbecue, parade, horse show, baseball game, and a free breakfast at the airport with many fly-ins. Genoa is known for its rodeo, fireworks display, and good hunting with two state wildlife areas nearby. St. Rose of Lima church is of Gothic architecture, its arches pointing heavenward like hands pressed together in prayer. Built in 1951, this building is the new St. Rose, an imposing stone structure that replaces the frame church made inadequate by the rapid growth of St. Rose of Lima parish. The brick smokestack stands alone where at one time it was attached to the power house that made steam heat which heated the buildings at the Indian Industrial School through underground tunnels. Electricity was also produced in this building.